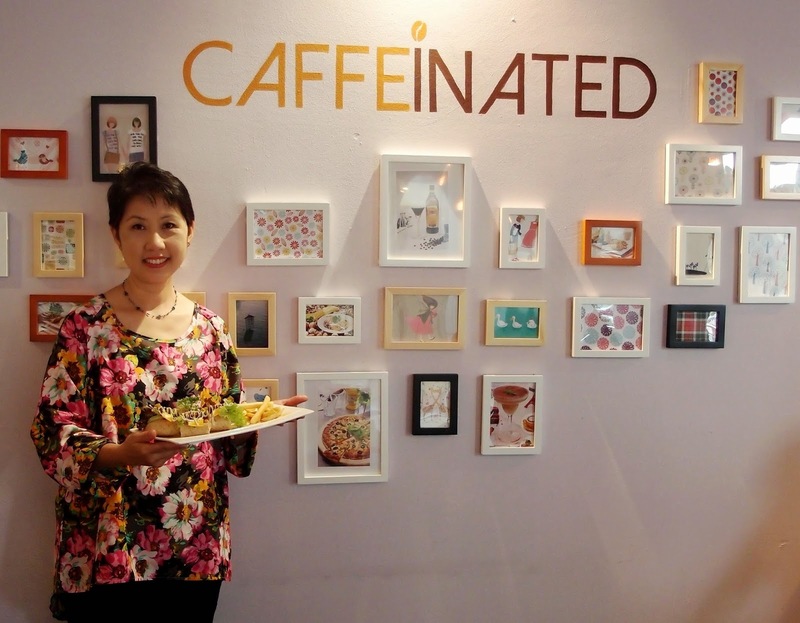 Satisfy your craving for coffee and everything else with coffee at CAFFEiNATED located at IOI Boulevard Puchong. Cafe owner, Tarick Tan ~ a barista himself came up with the idea of opening a cafe because of his interest in coffee. He takes great pride in coming out with the cafe's menu including some coffee infused dishes as well as the beverages too. 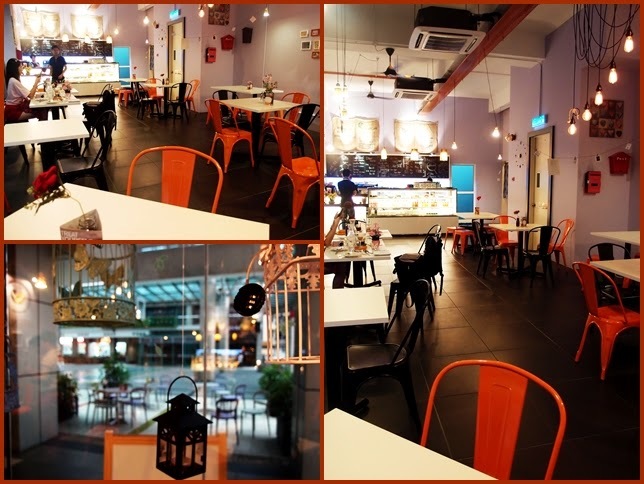 Tucked within the newly opened IOI Boulevard in the bustling Puchong township, CAFFEiNATED is located at the inner section of the mall, taking up the corner lot of the building. It's a small little cafe with simple decor, nothing fancy or fun and perfect place to chill or hang-out over good food, coffee and tea. CAFFEiNATED boasts of a rather expansive menu of beverages, commits to its namesake by offering its customers premium collections of teas imported from Holland ~ The Art of Tea Collection. sophisticated flavours of chocolate drinks from Zuma UK, Baileys Irish Cream and KahLua, a coffee-flavoured rum liquor from Mexico. Tarick said CAFFEiNATED's strength lies with its coffees as it features house blend medium roast, comprising four blends - Coffee from Brazil, Columbia, Sumatra and Mexico. Tarick, proud owner of his baby ~ Conti X-One TCI Espresso Machine. 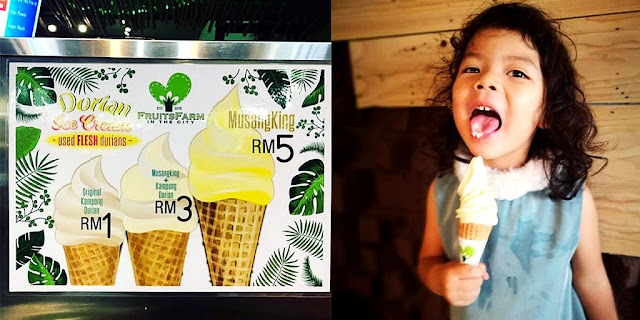 There are only two of its kind in Malaysia and is fully imported from Italy. A high tech coffee making machine to meet the demands of the modern day barista like Tarick, himself and serious coffee drinkers too, making it a serious proposition for any professional coffee bar! To start off, we tried several coffee infused signature drinks personally recommended by Tarick. CAFFEiNATED's Espresso Martini is an ice-shake combo of KahLua, Vodka, Espresso. Coming up next was ~ An exquisite Tarick's personal creation of Bailey's Tiramisu. Simply a concoction of mascarpone cheese, fresh milk, Espresso with Bailey's Irish Cream. Loved the unique smooth and rich flavour from a mix of cream, milk, finest Irish spirit and coffee, blends so well together like marriage made in heaven. Well, I always believe a little indulgence can make your life a little sweeter, so go ahead and give this a try! This is a combo beverage of Lemon Grass with Heineken. It gives off a nice grassy scent and fit well with the beer. If you are looking for a cool, crisp and refreshing beer to go with your food, this could be a good choice! For non-coffee drinkers, CAFFEiNATED offers premium grade chocolate drink ~ MOFO Deluxe. This dark hot chocolate drink is made using 100% Belgium Chocolate. This sweet and smooth MOFO Deluxe Chocolate is bound to please chocoholics with its high cocoa content and rich. indulgent chocolate taste. Specially caters to those looking for more sophisticated flavours in their hot chocolate beverages. To complement the beverages, Tarick had a menu of Western food with a little bit of fusion twist with some Espresso-based dishes too. 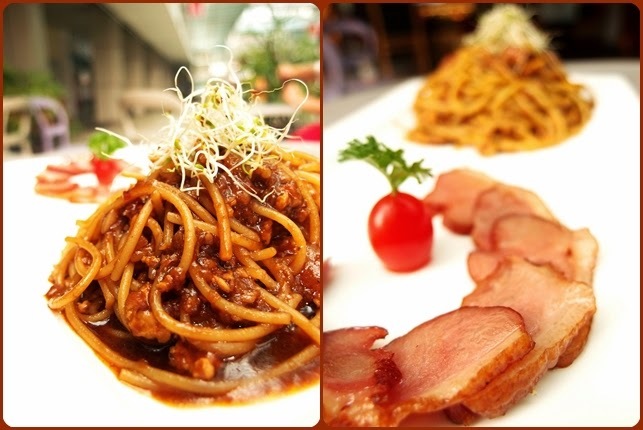 The menu includes pastas, pizzas, wraps, subs (baguette), breakfast sets, desserts and many more. Those enjoy pasta and mushroom will be delighted to savour Carbonara with Mushroom. The flavours were rich, creamy and thick in sauce. It was practically loaded with three types of mushroom - shimeiji, shitake and button, the Carbonara pasta is a Must-Try dish for pasta lovers! Another crowd favourite is the Mushroom Pizza with a barbecue base sauce topped with shiitake, white button, mozzarella cheese and black olives. Vega pizza is simple yet at its best with its 10" thin crust making it a light and great snacking food. If you are looking for a warm and comforting dish to keep your day going, this is the perfect breakfast dish. Their Mushroom with White Sauce was ordinary and unpretentious, cooked with Shitake, Shimeji, white button. onion, garlic together with heavy cream for the richness and finishing off with some dried parsley for the added flavour. You will loved the richness and smooth taste of the broth and it goes so well with the crunchy muesli toast that comes with it. A dish that simply screamed simplicity at its best and comes generously with lots of sliced mushrooms. Truly a creamy bowl of hearty goodness you can have it any time of the day! Coffee enthusiasts might want to try this, but honestly speaking, this special coffee-infused pasta dish requires an acquire taste. The combination of coffee and tomato based pasta, creates a unique feel and taste on the tougue - bitterish aftertaste just like eating the chicken and bitter gourd stew with fermented black beans. Coffee and tomato was just not a good match after all I guess. Cooked with minced chicken in tomato based sauce, onion, garlic, white wine, dried parsley served topped with alfalfa sprouts and served with sides of smoked duck. Anyhow, hat-offs to Tarick for coming out with such a challenging dish for its customers to try. So, if you are an adventurous diner, you might want to give it a try and let me have your verdict on this! Seafood lovers can take delight in CAFFEiNATED ~ Sharing Platter of 'Under The Sea'. 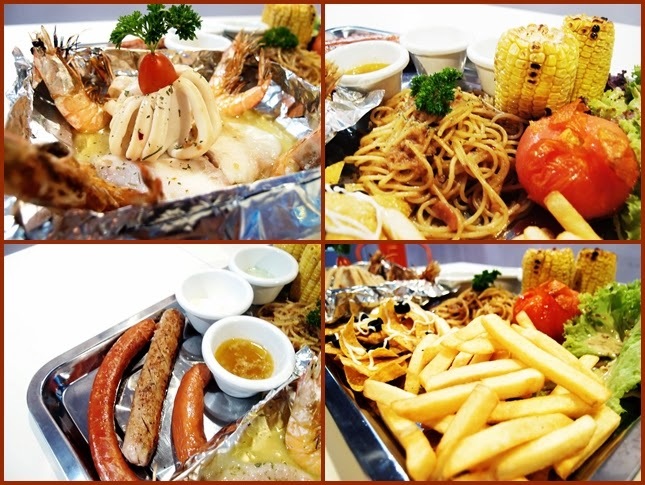 A scrumptious platter with juicy seafood of Dory fish, squid and prawns together with Foot-long, German sausage and Spicy French sausage, Aglio Olio spaghetti, fries, grilled sweet corn, tomato, sesame dressing salad and crispy nachos for extra bites. Enjoy it all with selection of dips ~ mayo, lemon butter and wasabi mayo. All platter comes complimentary with 1 liter of Apple Lemonade or you can top RM 10 to Lemon Grass Heineken. Please note that there is a minimum waiting time of 20 minutes for this platter. For Subs - Baguette menu, diners can choose between German Sausage, Lamb Leg, Turkey Ham or Smoked Chicken. We opted for the all-time-favourite German Sausage. The whole meal baguette came stuffed with Thuringer German sausage, green coral, red coral, cucumber, beef tomatoes, cheddar cheese, mayo, sesame dressing and savoury lattice with wasabi mayo dressing. Dessert came in the form of the heavenly Affogato and Dark Chocolate Float. I took a scoop of the everything in one mouthful and the combination of the rich yet not too sweet Affogato was absolutely wonderful. Tarick choose a sweet, honey sense of the Kapiti ice cream ~ Ponulukawa Honey flavour to pair for his Affogato. Two months ago I was invited by Premier Clinic, a reputable aesthetic clinic at Taman Tun Dr Ismail for their Ultherapy HIFU treatment. 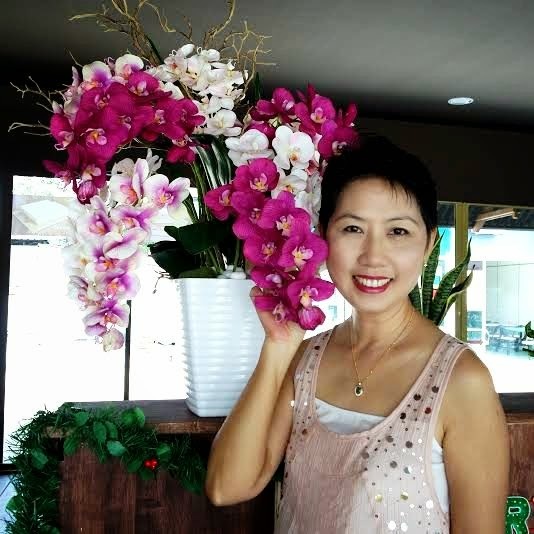 I would like to share my first-hand experience with you on my first treatment with a surgery-free micro lift and a totally non-invasive skin lifting procedures. This is my Final Post of the exciting experience I had at Premier Clinic after 2 months. 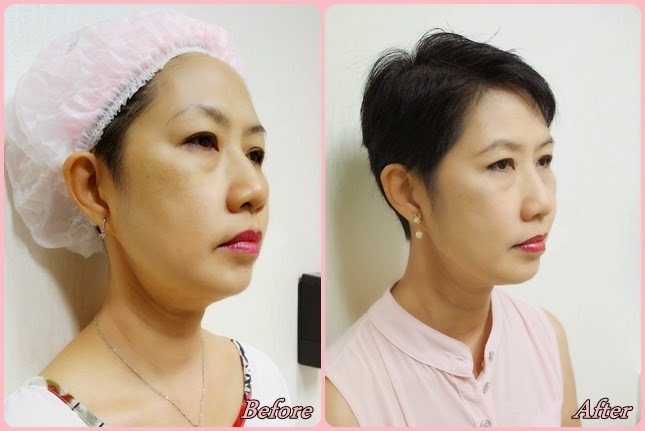 Read on below for the full account of my experience of the suture-less facelift ~ Ultherapy HIFU treatment and the post-effects of it here. My journey starts 2 months ago as I set out to see if time travel was possible. It wasn't a long journey and I was hoping to go on like - back tracking five years or so. 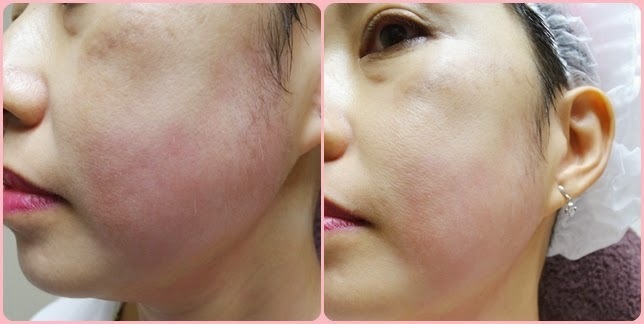 When I first was introduce to the Ultherapy HIFU I had very little expectation. 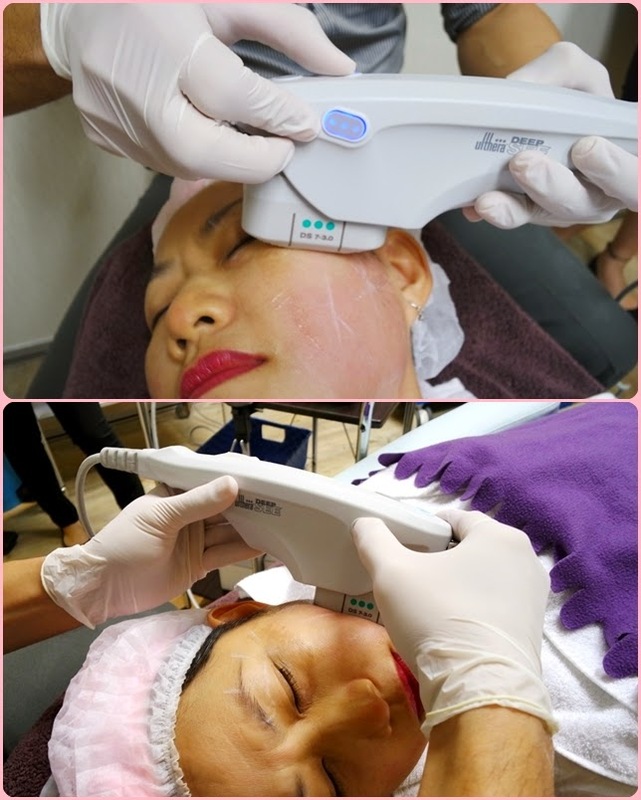 All I knew at that time was that I was there to get zapped with the latest beauty technology, an outpatient procedure that promised to kick-start my skin's deadbeat collagen, perhaps to reverse ageing signs on my face. Firstly, I took a painkiller to reduce the pain for nervous patients like me. The procedure started off with the nurse applying numbing cream on my face. The role of numbing cream is basically to reduce the pain by numbing the area specifically for treatment. Half an hour later, my face was feeling numb and it was thoroughly cleansed off to remove the numbing cream. Before the treatment begins, Dr Kee marks the area to be treated with a white crayon. After which, he began by applying sonogram gel to my face and neck area. For the next hour or so, Dr Kee inched an Ulthera wand over my cheeks, forehead, neck and jaw. I can feel the doctor gliding, pressing firmly, and zapping with the device slowly millimetre by millimetre while he asked about how I felt, assuring me that everything is fine and good. 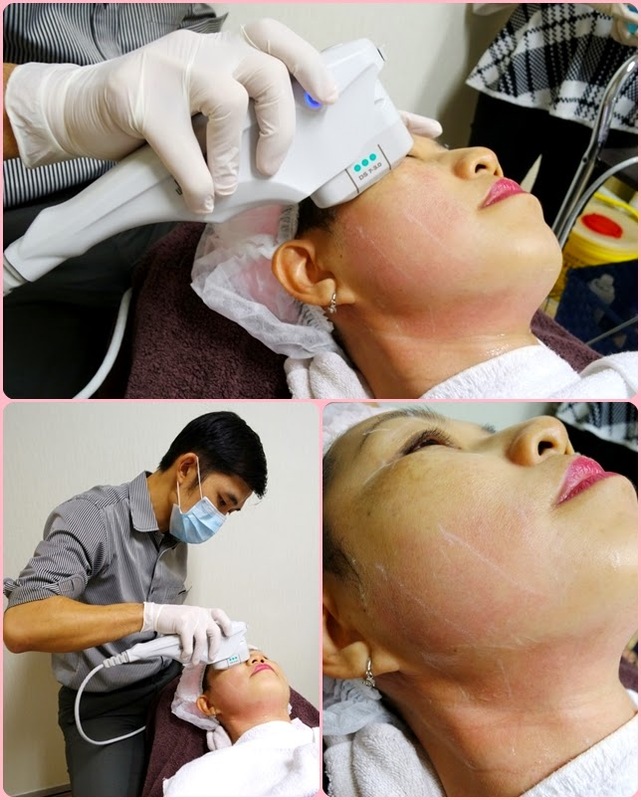 Dr Kee uses a unique "See and Treat" energy-based aesthetic technology whereby he can actually visualize tissue layers to 8mm using DeepSEE technology. The therapeutic capacity also allows the precise delivery of micro-focused ultrasound energy. The sensation of each of the ultrasound energy was like a split-second before you could actually register that something was too hot. It was the build-up to pain, without the pain. The only moments that triggers my nerve were the first couple of zaps over my cheekbones, sending vibrations ringing in my head. After working his way from neck to forehead, Dr Kee then handed me a mirror to show me the results. My cheeks were flushed, but other than that, there really wasn't an immediate difference. The entire process was over in about 45 to 60 minutes. The procedure was done professionally with Dr. Kee's gentle hands as he was very careful and precise throughout the whole ultrasound procedure. Assuring and professional, Dr Kee kept me as comfortable as possible while working his 'magic wand' over my face and neck. I have no prior experience before with Ultherapy treatment, a micro-focused ultrasound but this was quite bearable for me. The side effects of this procedure include mild to moderate redness and swelling which I did experience on the first 2 to 3 days. There is no downtime but my skin look slightly swollen and red after the procedure. I had a slight tingling or tenderness to touch, but these are mild and temporary in nature. I was told that it would subside within a few days and was advised to wear sunblock daily after the procedure. 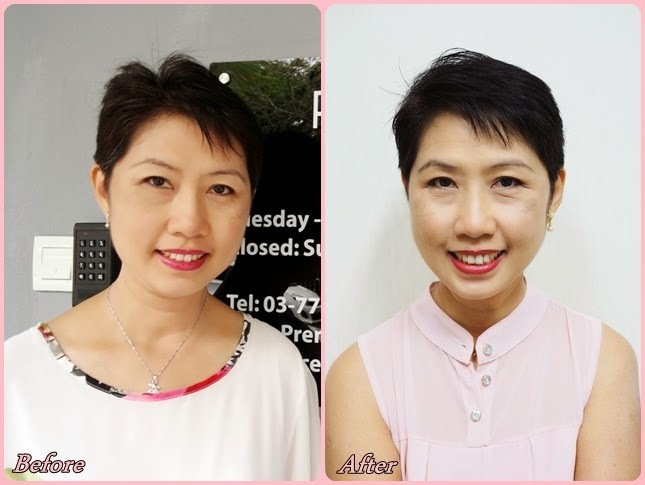 Below are photos taken of me on the 'Before' & 'After' of the Ultherapy HIFU treatment. I'm happy with the results. I noticed a more defined jawline, significant facial lifting and toning after 2 months. Further improvements can continue for up to 6 months after a procedure. Ultherapy reset the clock nicely for me. I believe it is the skill of my aesthetic doctor and HIFU (High Intensity Focus Ultrasound) ~ technology of the new era that gave me such amazing results! Following are photos of me taken 2 months after the treatment shows a naturally toned and lifted Auntie Lilly now! Close-up Selfie Photo with my Eldest, Carmen Hong ~ a Lifestyle Blogger too! I hope my write-up and sharing helps those who are looking for some instant "anti-aging" procedures. My post serves as an avenue for me to share my experiences with you, not just as a promotional post for these treatments. Personally, I believe that these aesthetic options had helped to enhance my features, making me look good for my age and also allow me to grow old gracefully. XOXO ! Two months ago I was invited by Premier Clinic, a reputable aesthetic clinic at Taman Tun Dr Ismail for their Ultherapy HIFU treatment. 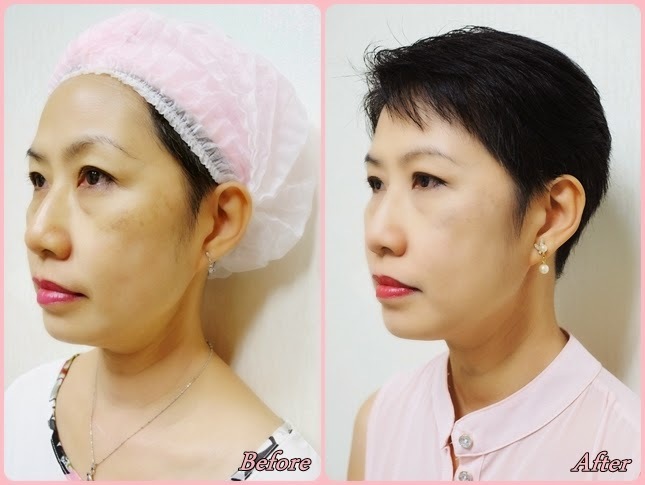 I would like to share my first hand experience with you on my first treatment with a surgery-free micro lift and a totally non-invasive skin lifting procedures. This is my Final Post of my exciting experience I had at Premier Clinic after 2 months. 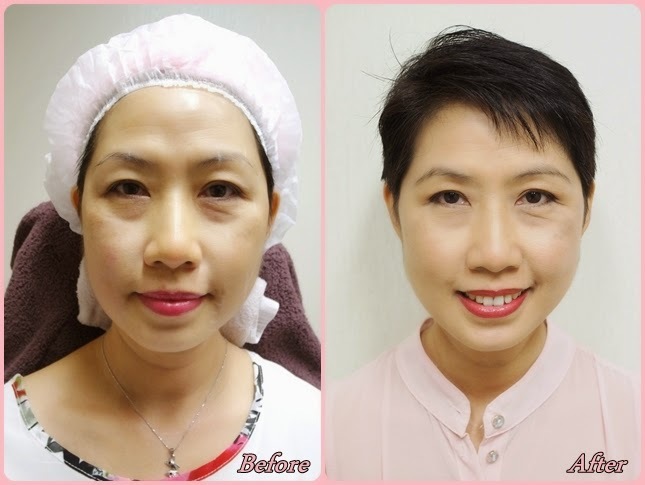 Read on below for the full account of my experience of the suture-less facelift ~ Ultherapy HIFU treatment and the post-effects of it here. Firstly, I took a pain killer to reduce the pain for nervous patients like me. The procedure started off with the nurse applying numbing cream on my face. The role of numbing cream is basically to reduce the pain by numbing the area specifically for treatment. Half an hour later, my face was feeling numb and it was thoroughly cleansed off to remove the numbing cream. Before the treatment begins, Dr. Kee marks the area to be treated with a white crayon. After which, he began by applying sonogram gel onto my face and neck area. For the next hour or so, Dr. Kee inched an Ulthera wand over my cheeks, forehead, neck and jaw. I can feel the doctor gliding, pressing firmly, and zapping with the device slowly millimetre by millimetre while he asked about how I felt, assuring me that everything is fine and good. The sensation of each of the ultrasound energy was like a split-second, before you could actually register that something was too hot. It was the build-up to pain, without the pain. The only moments that triggers my nerve were the first couple of zaps over my cheekbones, sending vibrations ringing in my head. After working his way from neck to forehead, Dr. Kee then handed me a mirror to show me the results. My cheeks were flushed, but other than that, there really wasn't an immediate difference. The entire process was over in about 45 to 60 minutes. The side effects of this procedure include mild to moderate redness and swelling which I did experienced on the first 2 to 3 days. There is no downtime but my skin look slightly swollen and red after the procedure. I had a slight tingling or tenderness to touch, but these are mild and temporary in nature. I was told that it would subside within a few days and was advised to wear sunblock daily after the procedure. I'm happy with the results. I noticed a more define jawline, significant facial lifting and toning after 2 months. Further improvements can continue for up to 6 months after a procedure. Ultherapy reset the clock nicely for me. I believe it is the skill of my aesthetic doctor and HIFU (High Intensity Focus Ultrasound) ~ technology of the new era that gave me such amazing results! I hope my write-up and sharing helps those who are looking for some instant "anti-aging" procedures. My post serves as an avenue for me to share my experiences with you, not just as a promotional post for these treatments. Personally, I believe that these aesthetic options had help to enhance my features , making me looking good for my age and also allow me to grow old gracefully. XOXO !